WE HAVE A COURT DATE!!!! This morning began with a lot of emails to weed through. The first one I noticed was from a family who is in Ethiopia and was sending new pictures to us of our daughter. Of course - I opened it immediately and I was so blessed to see how much she has changed. Her face is beginning to fill out. Her color looks beter! The way her had was in one of the pictures, it looked like she was pointing right at our picture. So cute!! And THEN.... I opened the "court date" email from Anna. I was so nervous! I am in Longview on my in-laws computer and they have a really slow connection so it was taking the page FOREVER to pull up. And then I read it!!! I immediately yelled out - OH MY GOSH!!!!!!! My mother-in-law and my sister-in-law were here with me and we all started screaming shouts of joy! Our court date is MAY 13!!!!!!!!!!!!!!!!!!!!!!!!!!!!! Hello - that's just 2 short weeks away! If was pass - which we are fervently praying for - we will travel anywhere between 2.5 and 4 weeks after the court date. OH MY - We could be in Ethiopia as early as 4.5 weeks from now. YIKES! I have some serious packing and preparations to attend to! Needless to say - I can hardly stand all this great news! I am beside myself. When we received our referral and became aware of how serious our daughter's malnutrition was I felt very compelled by the Lord to ask America World if there was any way we could expedite her court date so she could get the medical attention she might need. But I hesitated to ask that because so many families are waiting and so many children are in need. A few minutes later my friend, Karen, called. She knew nothing about what was on my heart and she knows very little about the adoption process but she said, "I really think you need to ask your agency to expedite your case." Right then, I knew I was supposed to ask. I submitted my request by email - nervously. I didn't want anyone to think I was being pushy or something. AND I fully expected them to right back and say... we can't do that. The next day America World sent an email and it said that they were going to do everything they could to expedite our case. I was thrilled to say the least. But a few days later I received an email again from AW that said the judge in ET said they can not expedite cases regarding malnutrition. AW was sad to reveal this news to me and was so worried that I would be disappointed. I was a little disspointed, of course, but only for a minute because right away the Lord reminded me that the expediting of this case was not really up to an Ethiopian judge - but THE Judge of judges - King Jesus. I immediately started praying to God saying, "The Ethiopian judge may have said no, but you put this on my heart and you can move mountains. You control this case, not the ET judge. Please move on his/her heart and expedite our case." Let me just say that as I prayed that I was thinking an expedited date would be anywhere between May 30 and early June. NEVER did I EVER think I would get a date on May 13 - that is just beyond what I could have ever imagined! So - now it's just time to pray for this court date to be a successful one! Thank you for praying along with us! 2 More Tidbits of GLORIOUS NEWS! The VanDruff's wrote again today to say that *T* is a thumb sucker! She also mentioned that when they visited her today she was in a different crib and not with the same boy - so she's not sure if they are really cribmates or not... but the fact remains that he needs prayer! Also!!! - Our family coordinator called today to let us know that *T* has gained almost ONE WHOLE POUND in under 2 weeks. At referral, *T* was 5.9 pounds, but as of today she is 6.8 pounds!!! All glory to God. Truly, this is amazing. And I just want to say this.... Each of you - every one of your precious prayers and the fact that we pray to the LIVING God who HEARS - is a part of this miracle and progress! We are incredbily grateful for all your prayers for baby *T* who will soon become Aria-Lu Foote! There is one other story regarding *T* that I received today. I sent a care package to her through another family. Rob - the man who traveled to ET to get his 2 girls (amazing story!) - took a friend with him. I won't share his name because I haven't asked permission to share his story. But this man is the one who delivered our care package to our girl today in ET. In the care package I also included a card to *T* with a blessing and prayer written in it and I had asked Rob and his friend to read the blessing and prayer over our daughter. Rob's friend is an adoptee. I don't know his full story. All I know is that I received word that he took the carepackage to our daughter and he read the blessing over her. He said that he could not do it "dry eyed". I don't know what all happened in that moment, but apparently God was there doing a work, not just in our daughter but in this man as well. He said that he hopes there was a little more love in his prayer as he himself was adopted as a child. It was a powerful email to receive today and I am so grateful for this man's willingness to pray over our baby girl. He also mentioned that it took a lot of people to deliver that blessing and prayer - his own mom, his adopted family, Rob and his family - including the girls they are adopting, me and this baby girl. The web of connections God puts together to bring about His will is so amazing! I am just amazed! I have so much gratitude and joy in my heart today with all this glorious news!! A Little News About Our Daughter! The sweet VanDruff family is in Ethiopia right now getting their 2 beautiful children! Pray for their son who is sick right now - and pray for all of them to get some much needed rest! Here's what Renee shared, "OH MY GOODNESS... she is so beautiful, and Cindy... she is tiny, but she LOOKS healthy to me! When I was looking in on all the babies I came to her and her eyes twinkled and she SMILED AT ME!!! It was the most precious thing. She seemed so peaceful and happy to me. Her cribmate was a SEVERELY malnourished little boy.........Pray for him, I don't know that he will make it. ....I'm so happy to hear that little *T* is your girl!!! I am telling you, and I am not just saying this, she sparkled! She was indeed very tiny..... Her smile melted my heart!! I wish I could strap her to my chest and bring her home to you. I can't wait for you to come get her." PLEASE PRAY with me for the little boy sharing our daughter's crib. May God restore him fully and breathe His life into him!! Also- - just wanted to share a cool story. I was reading a book yesterday about Ethiopia. One of the pictures had a girl whose features look similar to our daughter's. I looked at the caption underneath the photo and sure enough -it was our daughter's people group. I went on to read and it shared that her people are a Semitic and Cushite mix....I realized then that our daughter is a descendant of some of the great Biblical names - Moses and his Cushite wife!!! Many of our daughter's people speak a Semitic language... and then I remembered that our daughter's name - the name we are giving her -ARIA - is a Hebrew name! How cool is that! Our little "Lioness of God" has the perfect name! So many people ask, "What can I do to help?" Here's the answer! Our adoption agency is seeing an increase in the number of significantly malnourished babies coming in to their partner orphanages. Our agency has a transitional home in Ethiopia where children/babies chosen to be adopted are taken in and cared for until the parents can travel to get them. Many of the babies can not be referred to parents until they are healthy. This was our daughter's story. Our agency cared for her for 3 months before she was well enough to be referred to us. That entire time, America World was paying for our child's care - and the care and restoration of many many more. Often, these babies tummies are suffering from Giardia or other illnesses on top of the malnutrition. And the malnutrition alone can be severe. Just south of Addis Ababa is a region hardest hit by the current famine. We are expecting to see many severely malnourished babies coming in to the orphanages as a result of this. For these reasons, our agency is hoping to build up a supply of 2 special kinds of formula which have a molecular structure that alloww babies to digest the formula with great ease, put on the necessary weight and take in the nutrients for which they are starving. But our agency can not take on this task without donations of this formula and then sending that formula over with traveling families who are headed to Ethiopia to get their children and can take extra suitcases of this formula. Our family will be headed to Ethiopia at some point this summer (Lord willing!) and there are other families in our area who will also be traveling soon. So we are currently accepting any shipments of these 2 formulas that are donated so that we can pack them up and take them to these precious orphaned babies. We are asking for any donations of these formulas to be shipped to our home by June 1 so we know how much we have to pack for our trip and how much we need to get to other families traveling who can help us deliver the donations to the transitional home in Ethiopia. The 2 formulas we need to send are called Nutramigen and Alimentum Powder Formula. They can be found at Wal-Mart or HEB - BUT since you are going to have to ship them to me from where you are, the best way to do this is to go to www.amazon.com to purchase the formula and then ship the formula directly to me through Amazon. Someone told me that Amazon has the best price. We need the powder form - NOT the liquid as the liquid needs to be kept refrigerated once opened AND it is too heavy to fill our luggage with. It is usually around $27 a can. It takes 2 cans to feed one baby for a week. These formulas are broken down so that weak, malnourished babies can digest it and get the nutrients they need. These formulas will save lives! Our mailing address is: Cindy Foote, 3531 Hilldale Point, San Antonio, TX 78261. Just let me know if/when you are shipping them so I can be on the lookout. The next day was Easter Sunday. We celebrated Resurrection Day with Libby in the morning. Then we cooked and prepared our home for house church. Around 4 PM we drove across town to pick up both the Burmese family and an Iraqi refugee family for house church. When we arrived home with our special guests other house church members began to arrive. We had a big meal and then worshipped. After worship our Iraqi friend said she was moved and she believed Jesus was real but she had more questions. So another friend of mine and I took this woman to Aria-Lu's room and we shared with her and answered her questions and she became a follower of Christ. For 2 years we have waited to see God move this way among our refugee friends. This beautiful Resurrection Day was another amazing display of God's power to change lives. And our waiting was so worth it! Monday we were exhausted after such an intense weekend. But I had promised to go across town again to meet an Ethiopian refugee. To make a long story short I ended up meeting 9 other refugees - 3 or 4 Iranians, 3 Bhutanese from Nepal and a couple of others from Iraq, I believe. The woman leading the ESL class, not knowing that I am just a volunteer and that I only came to meet the one Ethiopian lady, introduced me to this table of refugees as someone who could help them. They immediately shared all their distresses, not being able to find jobs, needing help with paperwork, etc. I was completely overwhelmed. They all kept asking for my telephone number and the whole time they were talking I was trying to 1. understand their broken English 2. figure out another number besides mine to give them 3. make sure Libby was safe as she wandered around in an area that is NOT SAFE! I realized at that moment that my armpits were soaking wet and I was entirely stressed. I got out of there as fast as I could, put Libby in the car and proceeded to cry my eyes out. The stress of trying to care for all their needs was more than I could bear. That ended up being an emotional day all the way around, as I was still waiting for our referral call every second of the day! The next day was Tuesday, April 14. In the early afternoon a package came in the mail. It was a long awaited contract. Since September Billy and I have been negotiating with a small label for a co-publishing deal. I am not at liberty to share all those details yet, but it was a glorious feeling to have that contract in hand after months of working towards it and really YEARS of Billy waiting for such an opportunity as this. And as if that contract was not enough......That morning Libby said that Jesus was bringing Lulu's picture "tonight". There was a referral or two that morning for other families, so by the time 3:30 rolled around (which is 4:30 for AWAA and only 30 minutes before they close their offices) I thought I was in the clear and decided to take a bath and relax before I headed out with my friend, Cristie, for girl time. Of course, just after I washed my hair and stepped out of the tub, my cell phone rang and it was the beautiful numbers 703 - AW's area code. I answered excitedly and Terra asked if she should call Billy. Billy was with me, but we had her call his cell anyway so we could both hear the conversation without Terra having to hear Libby (like she would have if we had been on speaker phone). Once all the lines were connected Terra began talking and immediately her voice was hesitant and I realized this wasn't a normal referral call. She shared with us some details about our referral and this little baby's life. She had suffered from SEVERE malnutrition. Basically Terra was letting us know that while they chose this child for our referral we still had the option of saying "no." It was not the moment I had anticipated as I tried to work through the wide range of emotions and difficult information. This baby's story was so sad and I didn't know what questions to ask. After getting off the phone we received an email with our daughter's medical files and photo. I thought about sharing the video of us seeing her picture for the first time. But as I watched it I realized how guarded I was as I looked at her for the first time, not knowing if she would truly be ours. We were not sure yet if we were accepting the referral because we didn't have enough information. The medical files had typos and were somewhat confusing. I am very guarded in that captured moment and that just makes it too personal to share. The only way the video could be understood is if you know me personally and very well - then you might be able to read my mind and see all the aches and questions and simultaneous joy that was circling around in my head. In the video Libby says some VERY FUNNY things. Before the picture pulled up Libby said "I want to see Lulu" in the sweetest, tender way. When the picture pops on the screen she said, "Is that Lulu?" And I said, "Well, we're not sure yet. What do you think?" And she said, "No". I started laughing, but I was thinking, "oh no." Up to this point, Libby had been dead on regarding several details around our referral. So as she was saying this isn't Lulu I am thinking, "oh no, what if she isn't" and at the same time I'm laughing so hard because Libby went on to say, "She's black, she's really black." At this point I don't know why Libby is surprised by this after all the preparation I have done in talking to her about this. As I was laughing and saying, "of course she's black. She's from Ethiopia" Libby said confidently, "That's not Lulu because" and she stopped to gather her words and went on to say something that - in the moment I didn't understand because I still thought she was talking about the girl in the picture. As I've reviewed the video I realized that she went on to say something to the effect of "she's white. Let me go get my dolls that are not white like that girl." She was trying to say that Lulu is not black ENOUGH. In the picture of Aria-Lu her skin is very light and Libby was saying that she was not black like her dolls. So, on video we are like, "of course she is black." But poor Libby is like, "but the girl in the video is NOT black." Poor girl must have been really confused! While the video is subdued (and somehow funny at the same time), it is still precious to me because it is the moment I laid eyes on our Aria-Lu. I have NO WORDS to explain all the thoughts and emotions that were swirling around in me in that moment. Joshua 9:14, "The Israelites...did not consult the Lord." - This was in the first part of my reading and it was a reminder to take this completely to the Lord and consult him. Luke 16:19-17:10 - I won't type it all out here, but in this passage Jesus is telling a story about a rich man who was splendidly clothed and lived in luxury. And at his gate was a poor man named Lazarus who was covered with sores. Lazarus laid there longing for scraps from the rich man's table, but the rich man did NOTHING. And the story goes on to when the two have passed on and Lazarus is in heaven, but the rich man is separated from God. The rich man keeps calling out for pity, but Abraham answers him and says, "remember that during your lifetime you had everything you wanted, and Lazarus had nothing. So now he is here being comforted and you are in anguish." - And right as I read that I knew I had consulted God in his word and I had an answer. I am the rich man/woman. And though our daughter was malnourished and there could be long-term effects due to that, it didn't matter. She was Lazarus - imperfect in health (but perfect for us!) poor Lazurus whom God LOVES. And I could NOT ignore her or I would be in anguish! Then my prayer became, "Lord if this is not our daughter then I am NOT making that decision. You will have to do that by closing this door. I am putting this back on you. If this is not your will then make it impossible. We are moving forward with this one baby who, out of millions, was chosen for us. And if you do not close doors then she will be ours! And then I read the last part of that passage, "In the same way, when you obey me you should say, "we are unworthy servants who have simply done our duty." And that sunk deep. This is not about us. We are unworthy of this precious calling. We are simply doing our duty and in that we are humbled and blessed. The next morning is when Terra shared with me more of our daughter's story. She kept saying, "we understand if you need some more time to think about this." And finally I interrupted her and said, "you don't have to worry about saying that again. We have a clear word from the Lord that this baby is ours." I could hear the happiness in Terra's voice. She went on to share the story about our daughter's formula and after hanging up the phone I remembered Libby's sweet prayers and right then I realized how precious that confirmation was - that Libby was praying so specifically for this girl at just the right time. It was a crazy Wednesday morning as we announced to everyone that we accepted our referral. We were still emotional from it all, but now I was able to rejoice fully and celebrate. We got dressed and I took Libby to Chick-fil-a for lunch and she celebrated Lulu's referral and our acceptance of the referral with a delicious ice cream cone! And then we went to UPS to send our ACCEPTANCE LETTER!!!! (and money, of course). I love the picture below because Libby took it! She's good! I can't remember for sure, but I think we also went to Babies R Us on that day and shopped for a few items for little Lu. We came home and washed the premie pajamas and put a care package together for Lu. You can see the items we put in a zip lock gallon sized bag. Another AW family who is traveling to Ethiopia this week to get their child is taking the package for us. In the care package we included premie pjs with hat and booties, a photo book, a teething toy/rattle, wrist rattels, a silkie, 2 of our CDs and some letters to the TH staff and a blessing over Lu. On this same day, Thursday, I found myself sick and congested - and packing for a trip to Alabama. We were headed there to lead worship for a youth event in Dothan. As we packed I felt worse and worse and realized that I was probably going to have a rough trip vocally. Our trip began at 4:30 AM on Friday. Our flight took off at 6:50AM. Once in Dothan we met some sweet people and began ministry. Though I didn't feel very good (especially Saturday) we really had a great time. The people were awesome and they just jumped on every song and sang it out, even when I couldn't. On Saturday, in the midst of working and leading, we received a phone call from our real estate agent. There was an offer made on our house and it was decent enough to accept. We have been trying to sell our home since last June - 10 months ago!!! We've had 2 mortgages for 10 months and we had been praying for God's mercy - that He would allow our home to sell before we got Aria-Lu. The closing is now set for late May! On Sunday we flew home - we walked in our front door at 11:10 PM. We were exhausted to say the least. Can you believe the week we had??? A refugee came to know Christ, we got our referral, accepted our referral, received a special contract AND have a buyer for our home! God is so good!!! Everything we have waited for and longed for - for weeks, months and even YEARS - was all delivered to us within ONE WEEK! I have many stories to share about some other confirmations regarding our referral and some precious information that we were given by families who have already gone to ET and remember meeting our daughter. I will share those in little tidbits as we wait for that much desired court date! Thanks for reading along. To God be all the glory. Great things He has done!!! I have SO MANY updates to post here, but I am swamped! Just wanted you all to know that we have not fallen off the face of the earth and we are still THRILLED about our referral. There is so much to tell and yet we have to be careful not to be too detailed until we pass court. Give me another day or two and I will catch you all up.... Let me just say this... Last week was the most emotional, full, blessed week of our lives! WE HAVE A BABY GIRL!!!!!!!!!!!!!!!!!!!!!!!!!! Yesterday - Tuesday, April 14, 2009 we received a referral for a TINY baby girl. She is approximately 3 months old and she is a tiny, precious, beauty! There is a story behind our referral and why I am just now making this announcement today. Yesterday was a heavy day as we received a referral for such a terribly malnourished baby. Her story is sad and it was just hard to rejoice over the referral as we processed her circumstances and situation. AW's office closed just 20 minutes after our referral so I had to wait all night to talk with our family coordinator and get some more specific information. It took my brain a little while to realize that I had a millions questions! During the night and even this morning the Lord has continued to confirm that this is indeed our Aria-Lu ("Lulu"). As Terra described Lulu's situation during the referral call, all that kept going through my head was the name that God originally gave me for her - "Aria" - meaning "Lioness of God" in Hebrew. The Lord was showing me that this name is a promise of strength over her. He takes the small and simple to confound the wise. He holds the weak and adds his strength. I'm thinking of that verse "the joy of the Lord is our strength" and how God made Libby such a picture of His joy. I believe Libby is going to be the perfect sister for Lulu! There is so much more to this story. Some I might be able to share soon. The rest will have to wait. We can not share her picture with you until we pass court. We are, from this point forward, going to be praying first for Lulu's health and weight gain, then for a quick court date and then a SUCCESSFUL first court date so we can pass court before the Ethiopian courts close in August! Timing is important here! Lulu needs to be held and nurtured by the family God has chosen for her - US!!! - so that she can fully recover! One quick story of confirmation to share. Lulu is only a little over 6 pounds right now. But she was even smaller a few weeks ago. So our agency had to start shipping a special formula from the States just for Lulu. That is the formula she started responding to. Well - back in January and throughout February Libby was praying specifically that Jesus would send milk to Lulu. I never suggested that she pray that way. She just did it and now it makes so much sense. Indeed, Jesus has had to ship special milk to her so she could survive! Today, out of nowhere and not prompted at all, Libby said, "Momma, Lulu is crying and we need to get her." Then she said, "Lulu is crying and she needs her milk." A little while later while we were cooking she said, "Mom, Lulu is crying and we need to get her home. She needs her milk. Will Jesus give it to her?" And before I could answer she started praying out loud, "Jesus, give Lulu her milk and get her home. Thank you Jesus." I wonder what is happening in your world today? That is just one of many confirmations over the last 18 hours or so. We are thrilled, blessed, emotional, tired and rejoicing! We (I) have cried so many tears. I just want to go get her NOW! GRATEFUL AND BLESSED AND FULL OF JOY!!!! We are NUMBER ONE in line!!!!!!!!!!! Shala Bartley received a referral today for a one year old girl! Congratulations!!! SO... WE ARE NUMBER ONE IN LINE FOR AN INFANT GIRL!!! 10 Months and Counting... argh! Moving Mountains in Lulu's Room! In Lulu's room tonight a woman of Muslim background, moved by the Spirit during worship and Scripture reading, sat and cried and asked questions and....became a follower of Jesus! Mountains were moved in your room tonight, Lulu! Now... may the mountain called "WAITING" be moved so I can get to you! God has spoken to our family in many creative ways over the years. Little confirmations at just the right time, words of encouragement, even some prophetic words that totally came true and were such evidence of how we serve the Living God! He still speaks! Of course, everything spoken over us or to us has always been measured by the Word of God as to its validity. Dreams and visions.... they seem like such a mystery to many Western Christians. But to some of my Iranian friends and other Muslim background friends, dreams and visions are a normal way in which God has revealed Himself to them. Many had dreams of a "prophet" robed in bright white and they had such a peace in the dream, but didn't know who the prophet was. Then, at just the right time, God brought someone to tell them the Good News of Jesus and they realize...that was the man in their dreams! And they become followers of Christ. I hear stories from various mission fields about this all the time. The summer before we traveled to China to get Libby Billy and I led worship at our local church. After the service a man came up to me that I did not know. He told me that as I sang he had a vision of me pregnant. He said I was fully pregnant and glowing. And he just felt that I should hear about this vision. I did not think much about it at the time. We were close to getting Libby and I assumed the vision had to do with that somehow. About a month later we led worship at a camp. At the end of the service another man approached me that I did not know. He basically shared with me the exact same vision. He felt sure that it was not about our adoption but about a physical pregnancy that was to come. A little history here, before I go on with the story: Billy and I have never TRIED to get pregnant because of some genetic issues on my side of the family. But we have also never used birth control. It's always been on our hearts to leave that to the Lord and see what happens. We have not struggled with the desire for biological kids at any time. We have always had a heart for adoption and we've felt very complete and normal in that desire. It has been the most natural thing for us. Obviously, after a second vision that was explained to me almost exactly the same way - FULLY PREGNANT and GLOWING - I figured there was something to this. I called my friend, Terry and shared the 2 visions with her. She said, "Oh, Cindy, I have to tell you something". And immediately I wondered what she was talking about! She went on to say that her husband, Larry, had a dream about me being pregnant back when they lived in Africa. But the Spirit had not released him to share the dream with us yet. So we would have to wait until he was ready before we could know the rest of the dream. Several months later, we already had Libby, Larry decided to share the dream. He dreamed that I was FULLY PREGNANT and that in the dream a man was chasing me with a knife. This man wanted to cut the baby out of me, but Billy stepped in and shot the man dead. He said that the dream was more about Billy's role of protection in the spiritual realm than me being pregnant, but he remembered specifically that I was VERY pregnant in the dream. Shortly after Larry shared that dream with us, the Lord put it on my heart to adopt from Ethiopia. I struggled with it a little only because I wondered if the purpose of the dreams and visions were to put the desire in our hearts to have biological children. But the way in which I felt called to adopt from Ethiopia was so real that I just knew I was to move forward with that. Of course, at that time we had only had Libby a few months and Billy was not open to adopting again just yet. So, unbeknownst to me, I had another year to pray over it all. On Mother's Day the next year (2007) I was holding Libby during worship and praying that God would help us do the right thing - which I was convinced was adopting from ET. A woman that I barely knew approached me in the middle of worship and said, "The Lord just gave me a vision of you VERY PREGNANT and GLOWING. I don't know if it is a biological child or an adopted child, but it's going to happen VERY SOON." You can only imagine at this point how stunned I was that God was continuing to give this vision to random, but divinely appointed, people in my life! For months I continued to pray and wonder what all this meant. At the end of December 2007 the Lord finally put the desire in Billy's heart to adopt from ET and the journey began. I have wondered many times during this journey if those visions were for a third child - a biological child - or if the visions were about adoption. Today a friend of mine sent me a message through Facebook about a dream she had last night. In the dream I was BIG PREGNANT and GLOWING as we talked about Aria-Lu and parenting in general. She said that even though I was pregnant, she knew in the dream that the pregnancy was for Aria-Lu who we were adopting. The two were one. And it was about to happen AT ANY MINUTE! I am sharing this primarily for my adoptive mommy friends - especially the ones who, like me, have never been physically pregnant. 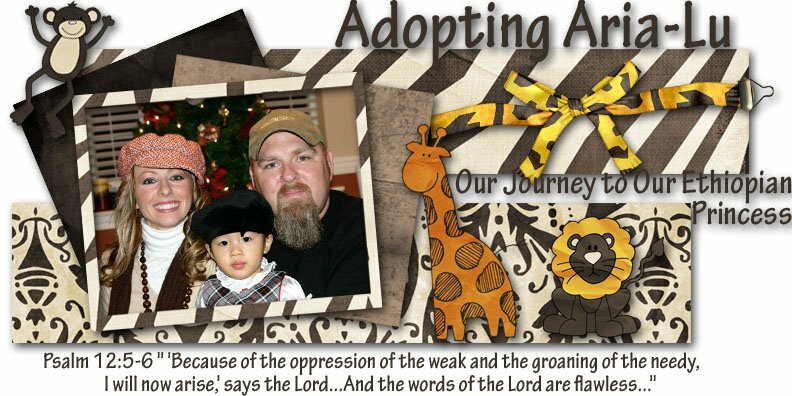 This adoption journey is the most real thing. I believe these visions and dreams have been for the purpose of confirming that in the spiritual realm adoption is a pregnancy. God plants the seed of desire in our hearts to adopt already knowing what child he has chosen for us. And from that point on we carry in us the child to be in a spiritual sense. In the spiritual realm we are pregnant and it is REAL! And we are GLOWING! It seems that the first two or three visions/dreams were about Libby as I was very near to receiving her. The rest have been for Aria-Lu - our sweet Lulu who is about to be revealed to us! I am in tears right now as I envision the beauty of this spiritual pregnancy. My heart and my emotions tell me it is real. But as I walk around shopping for Lulu other people, for the most part, can't see what I know is in me. So to have others who have been given a special glimpse into the spiritual reality of this pregnancy confirm such is very much a comfort and encouragement to me. I am not journeying to find Lulu. God has already found her for me and in the spiritual realm she is in me ready to burst forth! Praise God! I hope this thread of dreams is an encouragement to you and to anyone who is struggling with the idea of adoption. Adoption is NOT unnatural. But is IS supernatural! And for those who sometimes grieve missing out on having a child physically within them, know that in the spiritual realm you have missed nothing at all! It is the weekend. I just ran 4 miles on my treadmill to work out the energy I collected as I waited for the phone to ring today. I have been so calm all week. I'm actually very impressed that I have not been emotional or moody or abnormally impatient (I'm always a little impatient!) during this first week of intense waiting. Thursday night I had some anxiety and today I thought about it ALL DAY... but I think it was just the realization that if no referral came today I would have to wait through the weekend to start hoping for the referral call again. Now, at 11 PM, I am accepting that and moving on. It should be a great weekend... not too much planned. I am taking it easy and staying indoors as much as possible because I am SO ALLERGIC to San Antonio in general (but I still love my San Anton) and we are scheduled to be in the studio next week. I NEED my voice to be ready for that! And yes - this means there will be a new EP soon - 5 new songs by Billy!... sometime before early summer! Artwork for CD cover is looking great, songs are already laid down... just need to sing them! No pressure, right! But seriously - the studio will be a GREAT distraction from the wait - if necessary.. I would certainly rather have the referral Monday and then go into the studio with all that wonderful, blissful, care free energy! It's way better than anxious energy! I'm kind of rambling.... better go. Micah is a Kulp!!!!! Praise God! I can not begin to tell you the story that is Micah Kulp's today. There has been more spiritual warfare in the midst of his journey and the journey of 3 other children being adopted by another family. So much that I can not even begin to cover it all. But TODAY - at just the right time - little Micah passed court and became a Kulp after MANY months of labored prayer! The video the Kulp's have posted on their blog is priceless. All praise to God Almighty!!! Now we just have to pray the three children home who God has chosen for the Semlows! They are so close!!! !